It's not the most comforting thing in the world to have the director known for killing off his characters remind you of your own mortality. 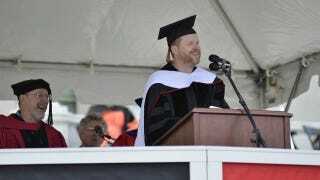 But Joss Whedon's speech at today's Wesleyan University commencement wasn't about comfort; it was about accepting contradictions and learning to listen to dissent from ourselves and others. You have, which is a rare thing, that ability and the responsibility to listen to the dissent in yourself, to at least give it the floor, because it is the key—not only to consciousness—but to real growth. To accept duality is to earn identity. And identity is something that you are constantly earning. It is not just who you are. It is a process that you must be active in. It’s not just parroting your parents or the thoughts of your learned teachers. It is now more than ever about understanding yourself so you can become yourself. And why is it important that we're all going to die? Because that's the contradiction inherent in humanity. We want to accomplish all of these big things in the world, while our bodies are interested in becoming fertilizer.